Ever look at the thousands of DIY costumes online and simply give up because they are way too difficult? These 10 costumes are truly DIY for any skill level. My favorite part about costumes is creating something unique and homemade each year. Making the costumes is one of my favorite parts about October. We have to get quite creative sometimes, to fit in with our strict costume rules. t Here is a roundup of costumes that fit our strict rules. t This baby fish costume would take some time to make, but it’s as simple as cutting out circles from felt. Anyone can do that. t This little snail may be slow, but making the costume will not be. t Want a near-instant costume? Simply add dinosaur spines and a tail to existing clothing. 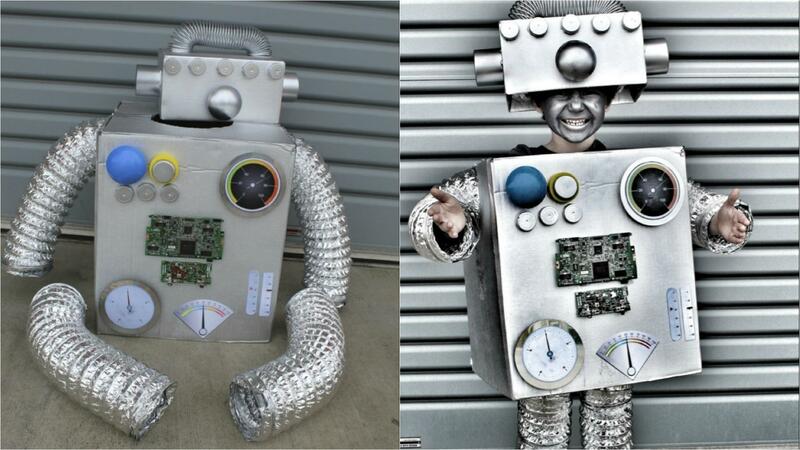 t Robot costumes are classic and take just a few items from the recycling bin. This costume from Paging Fun Mums finds the balance between simple and adorable. t Garden gnomes are adorable, and your little one will be the hit of the block with this equally adorable and easy costume. t This simple poodle costume uses items you probably already have lying around the house: leggings, a white shirt and some felt. t Don’t be fooled by how adorable this costume is; it is surprisingly sweet and simple to make. t Your little one will brighten up the sky, or at least the street, when she dons this beautiful cascade of rainbows this Halloween. Even better? This costume uses extremely inexpensive materials. t A scarecrow is meant to scare away crows, but with this sunshiny costume, your little one will only be scaring away bad moods. With just a few modifications, you can create this costume entirely from your child’s existing wardrobe. t The French Macaron is two airy cookies sandwiching a delicious filling. No filling could be cuter than your little angel. This costume looks impressive and takes just a few materials to create.